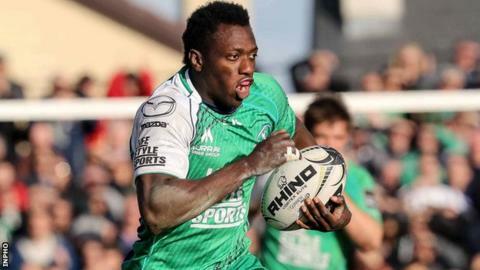 Connacht's fairytale story continued as they maintained the 100% record of home teams in Pro12 semi-finals to beat Glasgow and make their first final. In a pulsating match, Pat Lam's side led 10-3 at the break through a try from wing Niyi Adeolokun. Glasgow, who lost fly-half Finn Russell and prop Zander Fagerson in the first minute, responded via Leone Nakarawa. The hosts - thunderous and unyielding - dominated thereafter, AJ MacGinty's kicks booking an all-Irish final. That will take place at Murrayfield next Saturday, as defending champions Glasgow saw their hopes of a 'home' final disappear in Galway. An absorbing night had a thunderclap beginning. After less than a minute, Glasgow lost two men in a collision, their pivot Russell and tight-head Fagerson. Russell suffered a bang in the face and it was a worrying sight. He was tended to by medics and eventually taken away on a stretcher. As soon as the game restarted after a long delay, Connacht took control. They ate into Glasgow's line-out, forced the visitors into conceding a mountain of penalties and broke the defensive line time and again. Connacht were relentless. Men on a mission willed on by their passionate home support. Midway through the half it looked like all their pressure had paid off when Eoin McKeon went over in the corner after terrific work from Bundee Aki, Ultan Dillane and Tiernan O'Halloran. After a visit to the TMO, though, the try was ruled out for a slight knock-on early in the move from Aki. When Glasgow conceded yet another penalty, MacGinty opened the scoring, a kick that was quickly cancelled out by Duncan Weir, who had come on for Russell. Connacht's dominance carried on and eventually they got the try their pressure warranted. It came just before the break and had its origins in a delicate grubber kick up the right from Aki. Adeolokun ran on to the bouncing ball, gathered and then spun and and wriggled away from Stuart Hogg, Henry Pyrgos and Weir. It was beautiful footwork from Adeolokun but Glasgow's defence was calamitous. The half ended with Nakarawa crashing over the Connacht line under the posts, but heroic Connacht defence stopped him getting the ball down. The deficit was seven at the break. It could, and should, have been more. Glasgow stirred at the beginning of the second half. Nakarawa got on the ball as the visitors started to go through the phases and ask questions of the home defence. Mark Bennett cut through a gap on the angle past four defenders and Connacht were in trouble. They survived in the beginning but the waves kept crashing over them. Nakarawa soon thundered over. The intensity kept cranking up, Connacht having the lion's share of possession and territory. MacGinty put them 13-8 ahead only for Weir to bang over a penalty of his own to make it 13-11. Connacht had the champions under the cosh. They were camped in the Glasgow 22, winning penalty after penalty, kicking them to touch and driving their line-out maul into Glasgow's heart. It didn't bring a try, but MacGinty eventually opted for the posts instead of another kick to touch and stretched Connacht's leads to five points at 16-11. With nine minutes left, Connacht looked to have sealed it when Aki hit Weir with a howitzer tackle in the Glasgow 22 and forced a turnover. Connacht swept right in a blur, Henshaw flicking a pass on to O'Halloran who put Adeolokun away. The wing blasted through two tacklers to score a sensational try, but the TMO again chalked it off for a knock-on that was contentious at best. Connacht lost their prop, Rodney Ah You, to the sin-bin for the last seven breathless minutes after a high tackle of Hogg. Glasgow attacked and attacked but Lam's men just refused to buckle. The visitors were in tears at the end. Connacht's great adventure continues, deservedly and thrillingly. Connacht: T O'Halloran; N Adeolokun, R Henshaw, B Aki, M Healy; AJ MacGinty, K Marmion; R Loughney, T McCartney, F Bealham; U Dillane, A Muldowney; E McKeon, J Heenan, J Muldoon (capt). Sin Bin: Ah You (72). Glasgow: S Hogg; T Seymour, M Bennett, P Horne, S Lamont; F Russell, H Pyrgos; G Reid, F Brown, Z Fagerson; L Nakarawa, J Gray (capt); R Wilson, S Favaro, J Strauss.